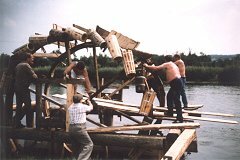 It's not an easy task to assemble a waterwheel, especially since it has to be erected in the continously streaming water of the river: Many helping hands are necessary -as well as special knowledge- to convert a heap of wooden parts into a working machine! 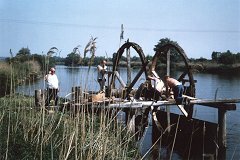 On this page, the erection of a waterwheel is described with the help of some photographs. In the base (»Radstatt«), a thick tree stem (»Wellenbaum«) is inserted as an axis. The radial spokes (»Radarme«) are then fastened with wooden wedges. The spokes themselves hold the outer wheel rims, the so called »Krümmlinge« crafted from stems of abnormally grown trees. All strap-joints and bolts are made of wood entirely! 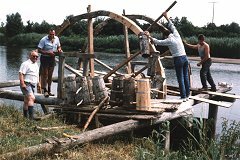 Now things are inreasingly becoming difficult, since the river is starting to push and turn the wheel without any mercy as soon as the first horizontal planks are reaching the waterline! Several volunteers and many rods pushed through the spokes are necessary to stop the wheel again and again during the assembly process. 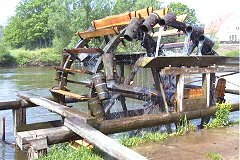 As soon as the wheel is running continously, it lifts and transports one bucket after the other of warm, nourishable water from the river's surface. A large »bathtub« catches the water spilled by the buckets on the zenith of their move, leading it through a channel of rough planks right into the digged channels of the farmland. The amount of water wasted by leaks is neglegible. 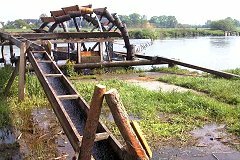 Although working day and night without stopping, a vintage water wheel needs amazingly little attention and service, as long as it is not blocked or damaged by larger pieces of wreckage or other man made things floating down the river. The axis is lubricated by dripping water, and besides that there are no moving parts.  Look at a device made from all natural materials, without any emissions and without the need for dangerous or poisonous fuel: a more environment-friendly machine is hardly imaginable! See the »Kleine Schäferrad« in live action! 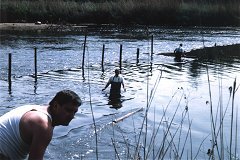 Four little video sequences recorded in August, 2003 show the running waterwheel from various perspectives. The video files are presented in AVI format for use with one of the usual media players (file size of each video is approx. 3 MB, running time is 20 seconds each). Download: Video 1 , Video 2 , Video 3 , Video 4 .